Having run a successful crowd-funding campaign at the Bowes Museum, Alison Nicholson, their Digital Communications Manager, was asked to participate when the Art Fund established “Art Happens”, their curated crowdfunding platform. One of the first projects on Art Happens was the Bowes’ campaign to save a 15th century Flemish altarpiece. Here Alison tells us everything she knows about Art Happens, crowdfunding and how passion and commitment are key. Can you tell us about Art Happens – what it is and how it came to be established? In a way the Art Fund has been ‘crowdfunding’ since 1903, bringing together groups of people to achieve something they couldn’t do on their own, i.e. buy a work of art for a public collection. Digital technology now makes it much easier to bring together groups of people and to share projects with them to harness financial support. They see the development of the platform within artfund.org as a natural evolution of what they already do – raise money to support museums. They also learnt a huge amount from Art Everywhere, a project to put 57 works of art on 22,000 commercial poster sites in 2013. They raised nearly £40,000 online from the public for the project and although they did not use a crowdfunding platform, they used crowdfunding techniques, including offering rewards to those who gave. Further, research commissioned by the Art Fund in 2013 to look at why only 40% of museums visitors claimed to ‘give’ to museums, showed that visitors did not understand why museums needed their support or what it was needed for. The Art Fund believed the use of reward-based crowdfunding techniques could, over time, open up a new funding source for museums, but they needed to begin to experiment on how to get it to work effectively for the broadest range of museums and galleries, big and small, national or regional. How did you get involved in crowdfunding initially? I became involved in crowdfunding after attending a couple of fundraising courses where it was touched upon as something new, worth investigating but considered a high risk approach to fundraising. Then I saw a full day workshop dedicated to crowdfunding advertised in Newcastle and just had to sign up for it! It was delivered by the very experienced Hen Norton, who established the first UK based crowdfunding platform ‘Wedidthis.org.uk’ and a member of the Kickstarter team from America. Having written a number of applications to Trusts and Foundations, with whom as a Museum we have a fairly good success rate but with long lead in times for responses, I was keen to have a go at crowdfunding which was going to be a much more immediate result. 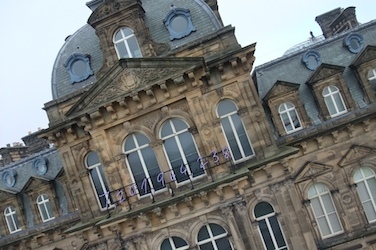 Having decided on our first crowdfunding project, to install a Gavin Turk neon number on the Museum’s façade linking to his exhibition of neons which was due to be on show inside, choosing the platform was instinctive hoping that Gavin Turk, who had already had a successful Kickstarter campaign for his arts charity ‘House of Fairy Tales’, may already have an enthusiastic online group of supporters. The first attempt was really exciting and exhilarating, raising £8,600 for the contemporary art installation. I loved using Kickstarter as a platform and felt a real affinity with the donors. With the uncertain future of arts funding, crowdfunding is certainly a new way of fundraising to develop and complement our diverse exhibition programme which includes contemporary art and fashion as well as fine and decorative art, as well as raising crucial funds for caring for the building and the collections. Building a ‘crowd’ of loyal supporters for a project, is equally important as raising the money. Increasing visitor numbers over the next five years is very important to our ability to become self-sustaining and encouraging those who have donated to a campaign to visit and explore our magnificent building, with its important collections of ceramics, silver and metals, toys, fashion and textiles, period furniture and paintings from the 15th to 19th centuries, is a key objective. Nurturing crowdfunding backers to become visitors and long-term donors is essential and communicating with them after the campaign has ended, with news of how their contribution made a difference, is paramount. What has your most recent campaign been for and was it successful? Our most recent campaign has been to conserve and redisplay our 15th century Flemish altarpiece. It is one of the most important objects in the Museum bought by our founders, John and Joséphine Bowes in 1859. For many years, it has been displayed against a wall, most recently in our early picture gallery. 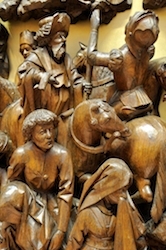 It features both oil on panel paintings by an artist known to us as the Master of the View of St Gudule and oak carvings created by the Brussels Sculptors’ Guild. The Art Happens project was to reveal and reunite the Renaissance Art, which would involve revealing the six paintings on the reverse and reuniting some wooden carvings in store with the altarpiece on display. It was a 60-day crowdfunding campaign and 10 days before the end we were only 45% funded. It was truly nerve-wracking but in the last ten days, but the momentum began to build and we secured over half of the £21,000 required, reaching our target with just hours to spare! It was successful not only in raising the money to conserve one of the most beautiful examples of religious 15th century art in the Museum collection, but also in reaching new donors, both Art Fund members and new audiences to us and the Art Fund. The reward fulfilment will engage donors right through the conservation process to the unveiling by the Bishop of Durham at Easter 2015. This campaign has been very different to the last one – has it appealed to a different audience? What have been the benefits of working with Art Happens? There have been numerous benefits of working with the Art Fund on their new platform, Art Happens. Aside from the consistently enthusiastic support of their marketing team, it gave us access to their communications channels and their growing membership. They shared our project, and those of the other museums and galleries in the first round, with their members and followers on social media and e-newsletters. We also benefitted from being in the first round of projects on the new platform as it was announced at their national press day on 17th June in London, so attracting lots of national media coverage. What is your advice for people starting a crowdfunding campaign? It’s tough and there’s no beating about the bush – you’ve got to hit the ground running and not stop until the end of your campaign. Have a detailed plan of who you will contact, and how you’ll reach them whether it be through an e-newsletter, social media, press and PR, flyers, posters, internal venue signage or networking. Re-word and re-invigorate the message each time, focussing on the individual rewards and what they will mean to each audience. Appoint campaign ‘ambassadors’ before you start and get them enthused about the project so that they can go out and passionately spread the word and tell a compelling story about why you need to fund your project. And a really distinctive pitch video is key. Remember that you need to capture the attention of the campaign visitors within the first few seconds of landing on your page, and film is far more captivating than text for many. Having only done two so far, I imagine every crowdfunding campaign is different. The only consistent elements I can think of are passion and commitment, and if you really want to reach your target, you’ll try everything possible to engage potential donors to buy-in to your dream. Stephen Deuchar, Director of the Art Fund, told Advisor: “Huge thanks to everyone whose donations and support have seen the first project successfully funded, making Art Happen. The combination of contributions at all levels has meant not only that The Bowes Museum can return one of the finest pieces in its collection to its former glory, but also that a new dialogue between visitor and museum has been forged. I shall be excited to hear how the restoration project on the Passion Altarpiece unfolds, revealing its hidden treasure for all to see, and to enjoy".